Not that anyone thought Jurassic World wasn't going to be a hit, but the fact that the sequel is now one of the highest-grossing movies ever released is something that caught a lot of people off guard. So, we're getting a follow-up next year and, while we all wait for the trailer, a brand new banner for Jurassic World 2 has been unveiled. The new poster comes to us from the Brand Licensing Expo in London and features the return of the T-Rex, Chris Pratt's Owen Grady and his pal, Blue the velociraptor. Universal Pictures hasn't officially released this banner, but it was shared on Instagram by by a fan. The banner features the previously revealed logo for Jurassic World: Fallen Kingdom at its center. On the left is the famous T-Rex from the original Jurassic Park, who many fans have taken to calling Rexy over the years, looking her usual amount of intimidating. To the right of the logo is Chris Pratt as Owen Grady, standing alongside Blue, who looks to be buddied up with him. The other thing well worth noting with this Jurassic World: Fallen Kingdom banner is the red-hot embers floating around. 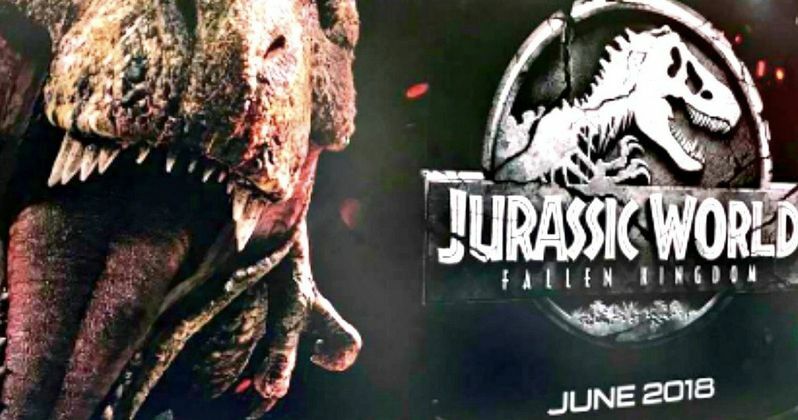 The first official poster for the movie also featured them and, even though the studio hasn't released an official synopsis for the movie, it has been rumored that there will be a volcanic eruption that threatens the life of the dinosaurs on Isla Nublar. Producer Frank Marshall all but confirmed that this is going to be the case and some of the early, leaked merchandise for the movie has featured a volcano on it. The real question is, when are we going to see the Jurassic World 2 trailer? Well, the very same Instagram account also shared an image that states the trailer may be coming a littler later than we anticipated. Recently, a rumor was circulating that the Jurassic World: Fallen Kingdom teaser trailer was set to arrive around Thanksgiving in November. However, if this post is to be believed, the trailer is going to make its way online December 13. Since Star Wars: The Last Jedi arrives in theaters on December 15, it's possible that Universal hopes to attach the trailer to that release, which makes perfect sense. This should be regarded as mere rumor for now, but you may want to make that date on your calendar. Colin Trevorrow, who helmed Jurassic World, isn't directing this time around, but he did co-write the script with Derek Connolly and serves as producer. This time, it's J.A. Bayona (A Monster Calls) who has to try and change things up enough so that we don't get bored with dinosaurs chasing people around on an island. Jurassic World: Fallen Kingdom is set for release on June 22, 2018. Be sure to check out the new Jurassic World: Fallen Kingdom banner, courtesy of Jurassic World 2015 Spain's Instagram, for yourself below.